Blacksburg’s only pet care facility with American Animal Hospital Association accreditation — The highest standard of quality for veterinary care in the US! From dogs and cats to turtles and rats, we provide veterinary care—including specialty services like dental and oncology—to almost any type of pet. Plus, enjoy our in-house grooming and short- to long-term boarding! Proud Member of the VT Community! From partnerships with local rescue shelters to marching in the annual Winter Lights festival, we are proud members of the Blacksburg community. Plus, our staff is packed with Virginia Tech alum. Go Hokies! 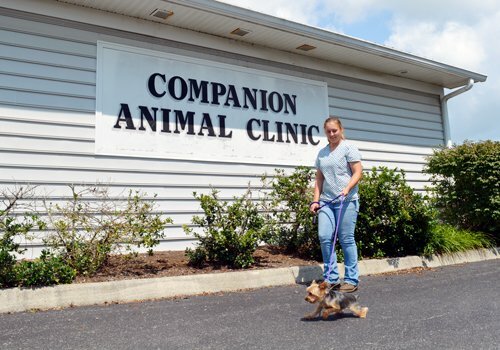 Companion Animal Clinic is a full-service animal hospital offering veterinary care to dogs, cats, small mammals, reptiles, and the occasional farm animal. 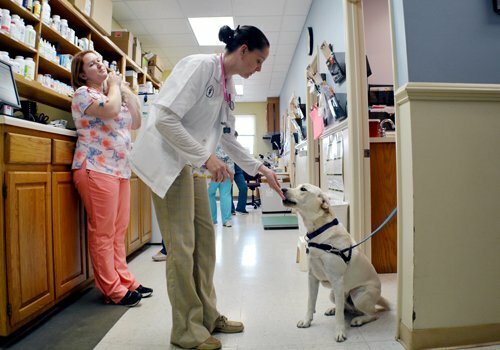 We provide checkups, vaccines, spays, neuters, and urgent care — All that, plus a great team and a comfortable, caring atmosphere at our veterinary clinic in Blacksburg, Virginia! Scroll down to learn more and feel free to contact us to make an appointment, arrange a tour, or ask questions. Access your pet's records, fill prescriptions, and schedule appointments. Login here! Companion Animal Clinic has provided quality veterinary care to the Blacksburg region since 1984. We care for all of Hokie Country, including Christiansburg, Newport, and Merrimac. We are the only animal clinic in the area with accreditation from the American Animal Hospital Association—the highest standards of veterinary medicine and customer care. Our professional staff members are committed to providing the best veterinary services! We are accredited by the American Animal Hospital Association, a standard of quality met by fewer than 15 percent of veterinary practices in the US and Canada.